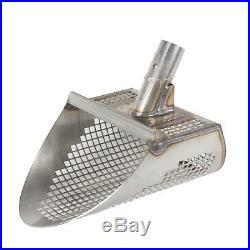 T-Rex 8 Wide Wet Stainless Steel Sand Scoop with 3/8 Holes for Metal Detecting. Batteries, Chargers & Cables. Books & Reference Material. Carry Bags, Pouches & Covers. Digging & Recovery Tools. Gold Pan & Classifier. Scoops & Diving Tools. T-Rex 8 Wide Stainless Steel Scoop. This durable sand scoop is ideal for metal detecting on the beach, in wet or dry sand! This is the new and improved T-REX, we have added extra tact welds to the top plate where the handle tube mounts to the re-enforced top plate of the scoop. A Gusset has been added to the front of the handle tube to add rigidity and prevent flexing of the top plate. These improvements will add rigidity and overall strength to the T-REX Scoop. The T-REX bucket is approximately 11 long by 8 wide and 4 7/8 deep. The top of the scoop is 5 deep to prevent targets from being knocked out of the scoop while hunting in the surf. On the top of the scoop is a tube to attach your handle. The Handle tube is angled at about 20 degrees so digging is easier than with a straight up and down handle. This also makes the scoop more balanced and feel lighter when hunting out of water. The 3/8 holes are punched close together to allow for quick sand release and catch those smaller targets that can be missed by larger 1/2 or 5/8 holes. There is no push plate on the back of the scoop for more control and better balance when pushing down into the sand. The gauge of the stainless steel is. 075 thick for the stress put on the scoop when digging in wet sand. The weight of the scoop is 3 lbs. On a postal scale (without the handle). Best of all it is made here in the U. I have hunted with the T-Rex sand scoop through its proto type period. The end result is, it is the best scoop I own. If the target requires a second scoop the T-Rex dumps easily allowing a second scoop to be taken before the next wave can cave in the hole. In the last year I have run this scoop through some really tough conditions. 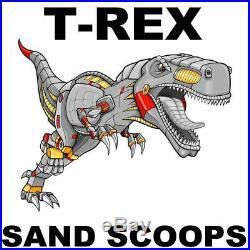 The T-Rex takes a big chunk out of wet the sand and most targets are recovered in one scoop. Steve D (aka BCNJ), Toms River, NJ. The T-Rex is an awesome scoop. I have had many people use the scoop and they all seem to like it. I have a few friends that have knee and back issues and they think it is a lot easier to use than any of the scoops they have used in the past. They like the flat back part of the scoop which is used to push the scoop into the ground instead of the small pads other scoops are using. This gives the scoop more stability when digging. Tim S, Gulf Coast Florida. Well built, lightweight, and strong! Bites hard, large bucket really grabs a load of sand! Drains fast in dry sand and in the surf!! Works great for me in our “wet cement” sand below the tideline!! Brian Mayer (aka Surfidigger). My new T-Rex is the scoop I reach for whether I’m hunting the dry sand or in the water. The design makes for fast, wide, deep and fast filtering of the sand. With the lightweight of the scoop I could carry this all day. Mike L, Cape May Courthouse, NJ. Must use a fiberglass or wooden handle only. Place handle into scoop with wood grain running from front to back of scoop, this allows for maximum support. Drill pilot hole into handle and insert screw, this secures the handle to the steel collar of the scoop. Listings for NEW Items. Listings for USED Items / Auctions. You have nothing to lose! We support our troops! We are located at. 3901 Bestech Road #100 Ypsilanti, MI 48197. Opening hours: Monday through Friday 8:30AM 5:00PM. Our reason for being is to help You find the Best Metal Detectors and Accessories that fit Your specific needs. It’s simple, we say NO to junk and make your Metal Detecting Experience GREAT. With Serious Detecting you know you will get high quality products and service without compromises. The item “T-Rex 8 Wide Wet Stainless Steel Sand Scoop with 3/8 Holes for Metal Detecting” is in sale since Wednesday, April 9, 2014. This item is in the category “Business & Industrial\Test, Measurement & Inspection\Test Meters & Detectors\Metal Detector Accessories”. The seller is “serious_detecting” and is located in Ypsilanti, Michigan. This item can be shipped to United States, Canada, United Kingdom, Denmark, Romania, Slovakia, Czech republic, Finland, Hungary, Malta, Australia, Greece, Portugal, Cyprus, Slovenia, Japan, Sweden, South Korea, Indonesia, Taiwan, South africa, Belgium, France, Hong Kong, Ireland, Netherlands, Poland, Spain, Italy, Germany, Austria, Bahamas, Israel, Mexico, New Zealand, Philippines, Singapore, Switzerland, Norway, Saudi arabia, United arab emirates, Qatar, Kuwait, Malaysia, Brazil, Chile, Colombia, Costa rica, Dominican republic, Panama, Trinidad and tobago, Guatemala, El salvador, Honduras, Jamaica, Barbados, Bolivia, Ecuador, Guadeloupe, Cayman islands, Peru, Paraguay, Reunion, Uruguay, Bulgaria, Latvia, Lithuania, Estonia, China, Thailand, Ukraine, Bahrain, Croatia, Jordan, Viet nam.